Millennials are a tricky generation. They like it when companies make recommendations that make shopping easier (55 percent), but at the same time get chills when companies know what they want before they’ve told them (54 percent). SDL (who we have previously covered) has released part one of a five part study called “Five Truths for Future Marketers.” Part one, titled “Campaigns are Extinct,” explores how millennials react to marketing and why traditional campaign strategies won’t get the job done anymore. The study sampled more than 300 millennials in the U.S. between the ages of 18 and 36. One of the more interesting findings was that five out of six millennials connected with companies on social media networks. Facebook, Twitter and YouTube came in as the top three social networks used when doing so. Another intriguing finding was the two main reasons millennials engaged companies, discounts (60 percent) and free perks (55 percent). 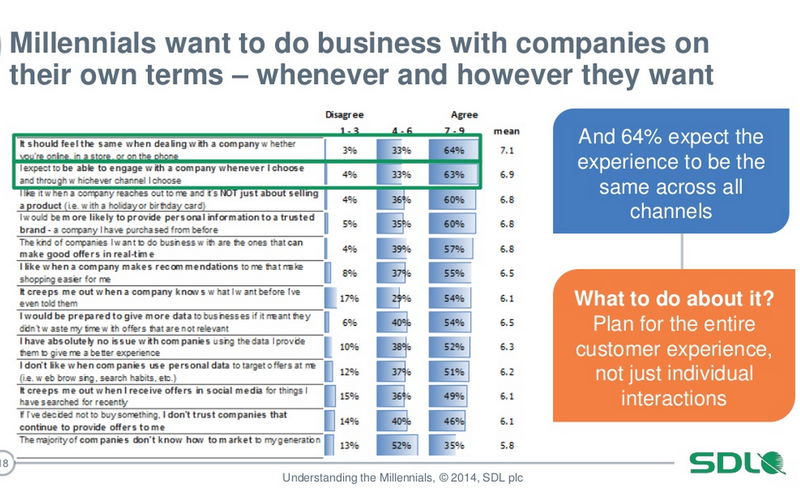 The finding that stood out the most, however, was that 64 percent of millennials believe that it should feel the same when dealing with a company across all channels. 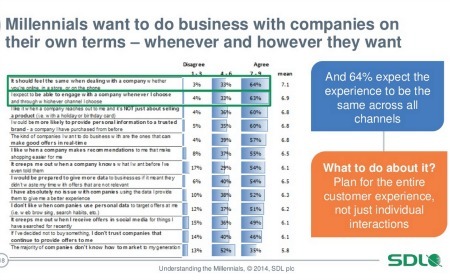 This means that millennials prefer companies who operate using the omnichannel approach as opposed to those who still use the multichannel method. With the average millennial checking their smartphone 45 times a day, it’s clear that they are a digital generation. As they proceed further into their careers and become the generation with the most purchasing power, it is crucial that marketers understand as much as possible about them.